Avoid this company absolute scammers. Opened up 2 contracts when only signed for one and insisted I pay postage back after telling me they would refund but never did. When returned phone just ignored emails etc. Awful company. 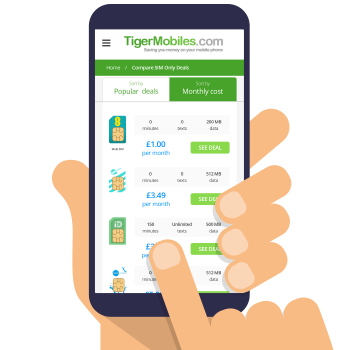 Find the best mobile phone deals using our easy to use comparison tool. We compare the latest handsets on every UK network and source exclusive deals you won’t find anywhere else. Very rude and disrespectful customer service with comments like "well its not my problem". Great service, amazing deals. Small problem was sorted out professionally and quickly. Thank you. Fonehouse had a great deal on a phone and I decided to go for it. I received the phone and was happy with it until it developed a known fault. This is where the trouble started. Fonehouse said I had to go to the manufacturer directly as it was just over a month since I got the handset. I pointed out the legally they were responsible, the response to which was a copy of their policies again denying me my basic consumer rights. I replied and informed them I would take it to trading standards and the ombudsman, then they decided to play ball. Then I had to post it, then wait for them to test the phone, confirm the fault then decide it was worth doing... It was dragged out over a week, in which time I had to source a temporary handset as fonehouse offer nothing to cover. Not only does fonehouse neglect to observe the rights of the consumer but they also have very poor customer service set up. I heard a lot of apologies and was told I would be compensated. I wasn't. Avoid this company, if you have any issues their own policies are such that you shall have a battle to get even the basics any other provider would give. "Fonehouse is an appalling company"
I selected an online contract for next day delivery on the 28th November, Cyber Monday deal for the Huawei Mate 20 Pro. Fonehouse have been useless, they provided me with no updates on why there was a delay or even emailed me at all. I have had to chase them up at every step of the process. Firstly they said the network has declined the contract, I then contacted Vodafone to find that I was perfectly eligible for a new contract. Following a long back and forth over many weeks, I was finally waiting for someone in Fonehouse to contact someone in Vodafone to set up the contract manually. They had promised over the phone that I still had the contract. This was well into December (17th) at this point I had basically given up and ordered a phone from Vodafone directly (which came the next day). Knowing that I could always return it if Fonehouse came through. Called them up today only to find that for the past 3 weeks they have had Vodafone decline the contract with absolutely no explanation why, and they just decided not to tell me. TL; DR: Don't ever use this company, they put up contracts that they cannot commit to and lie to you for weeks, without giving you an update. "Terrible company. Do Not Buy." Ordered a phone on Black Friday. They kept pushing the delivery date back saying my order had been referred. I tried emailing with no response, eventually almost two weeks later the order has been rejected. I find this very hard to believe as I know I have a great credit rating. The whole things a scam, Fonehouse are a sham of a company. Do not be fooled by them, if it’s too good to be true it probably is. Ordered a Black Friday deal, which was apparently too good to be true. They kept postponing the delivery date. Now their customer service line has been turned off. Hugely disappointing, as I could have gone for an alternative deal in Black Friday, but now the deals have all ended. Avoid at all costs. "Great deal + good customer service"
"No updates on my order 5 days after placing it." I called to chase up my order after 5 working days after placing it! After spending 15 minutes on the phone, I was told it might take more time for them to dispatch my order. So I cancelled it. Very quick delivery. Kept informed every step of the way right down to the time it was actually delivered. Really pleased with my contract. Super fast delivery of my new iPhone XS and a really good deal which my current phone provider couldn’t even match (and they admitted when speaking to them on the phone when cancelling my existing contract that this was a great deal but also tried to tell me using resellers is a bad idea lol). Secure and speedy delivery with DPD. Very happy and would recommend!! I would and have recommended Fonehouse to my friends. I received my new mobile within 2 days and saved myself a lot of money over going through the service provider. Excellent service, I ordered a Samsung S9 on a Saturday evening and received phone Monday morning. Highly recommend fonehouse, great company. "Really good service – happy customer here"
I found Fonehouse and their sales advisor, Jess to be exceptionally professional and helpful. I was in a quite a hurry when ordering my phone. I was a little reluctant in using Fonehouse only because what you see on the internet and also I have been with a direct Vodafone customer for over 20 years. However, her service was exceptionally professional, courteous and made the order very clear and put my mind at rest. I have received the phone the very next day as promised and all seems ok. Paperwork included from Fonehouse detailing what I need to do and also the agreed terms. Happy customer! Had a mixed experience with Fonehouse. I wanted an iPhone X and found one easily enough on their website, just a couple of clicks and no fuss. Their website promised "free next-day delivery" if I ordered by 20:00. I actually completed my order just a wee bit after 8, so thought it might be delayed. But no, courier turned up the next morning with my phone. Only issue was no SIM Card, so I got back on their website and dug-up their support email thinking it was going to be a nightmare to fix. However, was pleasantly surprised — very nice girl called Claire emailed me back within the hour and it was all sorted by the next day. Things can always go wrong, but it's nice when a company takes ownership of their mistakes and puts them straight without any faffing about. So kudos & thanks to Claire! My experience with Fonehouse was pretty run of the mill really. I bought a Samsung Galaxy S8 Plus from their website, the black 64GB model to be exact. The deal was reasonable (£80 for the handset, twenty four months at £33, unlimited minutes and texts, and twenty gig of data), with free delivery. It arrived in one piece, and worked out of the box. No problems since. So, Fonehouse, nothing special but reliable enough, and they did what they said they would do. In the end, what else do you need from a mobile phone company? I ordered a black Samsung note 8 on 11/7/18 online, with free delivery the next day and the promise of a confirmation email, I received a link to login to their website. 12/7/18 still no confirmation email or new phone, I contacted them and was advised that they had to send the phone to Vodafone to get the sim installed and it would arrive on 13/7/18. 16/7/18 I contacted them and was told that there had been a problem with the Vodafone connection software but they expected it to be sorted and would send an email to update me and that I was a priority. I did not receive an email. 17/7/18 contacted them and was advised that they had been very busy over the weekend therefore it would take longer to process my order and on top of that they had no black phones so if I wanted it quicker I had to get a gold phone, when pushed on delivery date they confirmed 19/20 July, a week after I ordered. I cancelled the order. Then the post arrived and a letter from Vodafone confirming the info regarding my plan contract start date 12/7/18 hmmm!! Now I have had to contact Vodafone, who were very helpful, but I have to contact them again once my direct debit has been taken so I can be refunded. The site claims to have a next day delivery service... this is far from the truth. Having ordered my phone well before the previous day cut-off time for next day delivery, i contacted the company via Facebook to check the status of my order. I was then told that the phone 'should' be with me the following day, meaning that i'd receive the phone 2 days after ordering it. This may not seem like a big problem to some people, but to me this is a trades description violation. I ordered the phone on the condition that i would receive it the next day, as clearly stated online. Having not even accepted an apology, and a very lackadaisical email from the customer 'care' team im rather annoyed with the arrogance that my order will now 'hopefully' be with me 3 days after it should have. Having read several reviews online, i see that i am not the only one. I have requested that they change their descriptions on their website as it is VERY misleading. "Best Deal I Could Find"
I waited a few weeks before writing my review of Fonehouse just to make sure there weren't any problems. I purchased a Galaxy Note 8 on EE and it's been great. I read a few negative reviews of Fonehouse but decided to take the plunge as the deal was very good. I'm glad I did, 129 up front and £33 a month for 8GB with unlimited minutes and texts. Fast delivery with no issues at all. Would definitely use again. "Best Prices around at Fonehouse"
This company offer the absolute best prices in the UK and I compared pretty much every retailer! Very smooth and simple process from ordering the phone to having the handset in my hands the very next day. I would highly recommend. 5 stars all the way. I want to leave this review especially due to the top class services provided by the customer service staff at Fonehouse. Unfortunately, the phone was delivered damaged and their team have been outstanding in rectifying this, replacement arriving tomorrow in time to start my new job. I can’t thank you guys enough for all of your help today. First class company! This is the second time I've used fonehouse now in as many weeks and can honestly say they are second to none. Unbeatable deals even when I've rung the networks direct they can't match. Ordered Monday received Tuesday with fully traceable delivery. Wouldn't hesitate to recommend thanks. Ordered my phone from fonehouse because they had the best deals on EE. Delivered quick but had a few issues porting my number. Think they are fairly new to the market as I've not heard of them before but overall I would use them again.